My prediction was wrong. Erap was found guilty of plunder charged against him. 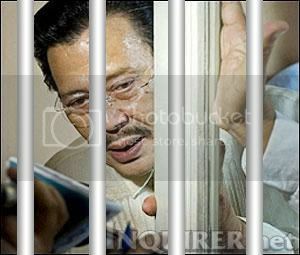 Credits to Inquirer.net for the image, i used it without permission :P.
Previous Post:Verdict Predict: Erap – Not A Convict! i was also wrong! i thought he’d be acquitted, too, all because i thought Gloria will meddle and influence the Sandiganbayan (popularity cause, so i thought). but i was wrong. i was shocked to know he wasn’t. just couldnt get the idea why he was not guilty of perjury though. We’ll just wait and see in the coming years :P…Something will change, probably. I was wrong about the perjury case.. thought he’d be found guilty but for plunder, somehow I know the jury will find him guilty..
somehow I know the jury will find him guilty. Erap’s case was decided by a special court, not a jury.